This blog entry and that one which will follow documents a bit of saved vacation time I used to travel between working at eye clinics in Rotorua, New Zealand and Honiara, Solomon Islands. Though it was vacation, I certainly pushed myself and learned a lot. I hope some of these things I learned might be educational or enriching to the reader in some way. But first, something about my last post. I referred to the Solomon Islands as a “third world country” and was kindly notified by a friend of mine that this terminology is outdated and can be offensive. She provided an NPR Article entitled: “If You Shouldn’t Call It The Third World, What Should You Call It?”. I was grateful for being informed of this. I felt a little dumb at first, but really was grateful for being enlightened on this topic. The truth is that the term is an outdated relic of the 20th century. Even “developing country” isn’t an accurate term because some lower income countries are more developed in certain aspects than certain countries which are considered advanced. The truth is different populations exist within single countries, and perhaps countries shouldn’t be classified as a whole in this respect. I’ve often use the term “underserved communities” to describe gaps where healthcare is not easily available. It is a difficult topic, but one worth thinking. While some would say this “political correctness” is an obstacle to progress, I think careful consideration and discussion is rather a bridge to better understanding. Back to the trip. I said goodbye to Rotorua at the airport which had no security checkpoint (really). It was overcast and I was sad to miss out on seeing a lot of the Southern Alps. I landed in Wellington, which is on the very southern tip of the North Island. I was greeted by a “Welcome to Middle Earth” sign, and a large sculpture of Gandalf riding an eagle at the airport. I was collected by another truly gracious host, Tony. Wellington, is a stunningly beautiful city. Well the Parliament building is quite ugly, but otherwise it is a remarkable landscape of mountains tucked against the ocean with houses scaling up steep cliffs, many of them partially supported by stilts. Remarkable for an area with such frequent violent earthquakes. In fact I saw damage to many of the buildings and the shipping port from the most recent quake. 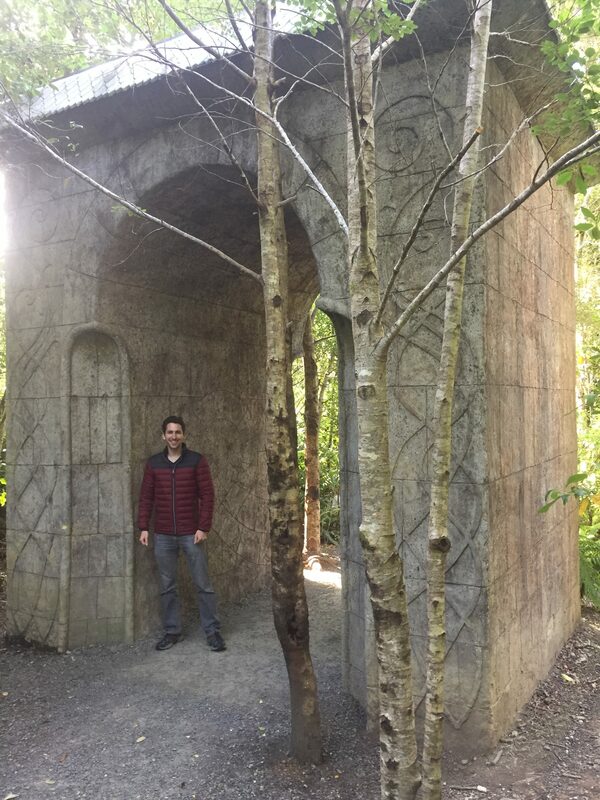 My first day in Wellington included a tour of Weta Cave, 4 hours in Te Papa Museum, and then a scavenger hunt of sorts to four different Lord of the Rings filming locations. I’m a bit obsessed if you can’t tell. Weta Cave is where all the props and costumes for the LotR and Hobbit films were designed and created. Also King Kong, District 9, Avatar, and lots of other films. There’s a Hollywood sign-esque “WELLINGTON” sign that has the last few letters purposely appearing like they are being blown away, which gave me a chuckle. Wellington is a remarkably windy place. 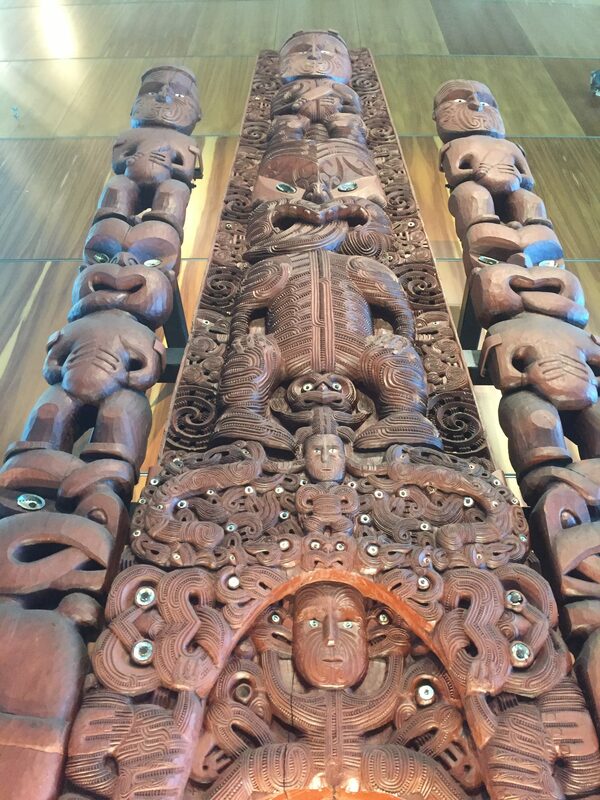 Te Papa is a remarkable museum, and a must-see for any visitor to New Zealand. Admission if free, and honestly 4 hours was not enough. All exhibit captions are in English and Maori. I learned all about wildlife on land and in the oceans surrounding New Zealand. There is currently an exhibit dedicated to the Battle of Galipoli, which was fought during World War I. New Zealand and Australia fought together in the long and bloody battle, which was lost. It was the first major war for New Zealand as a sovereign nation, and Maori and kiwis of European descent fought bravely together. 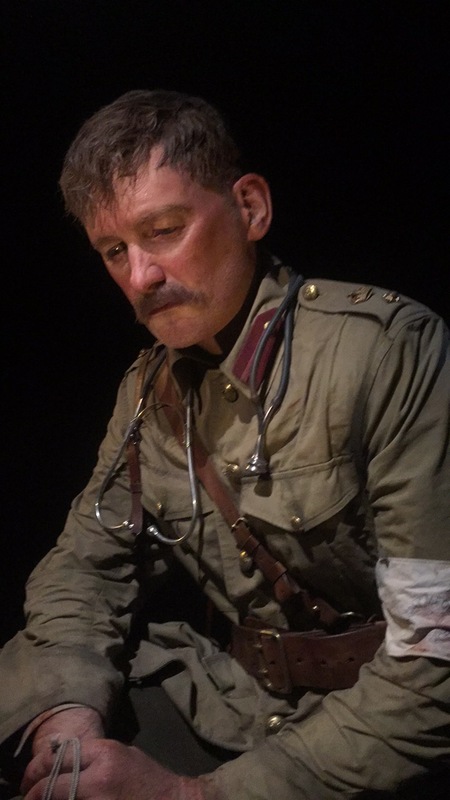 The exhibit features extraordinarily life-like sculptures of actual people who fought in the war. These sculptures I believe were scaled 6x larger and were enormous. They were created by Weta and I had the opportunity at Weta to see an artists inserting hairs individually to another sculpture yet to be added to the exhibit. 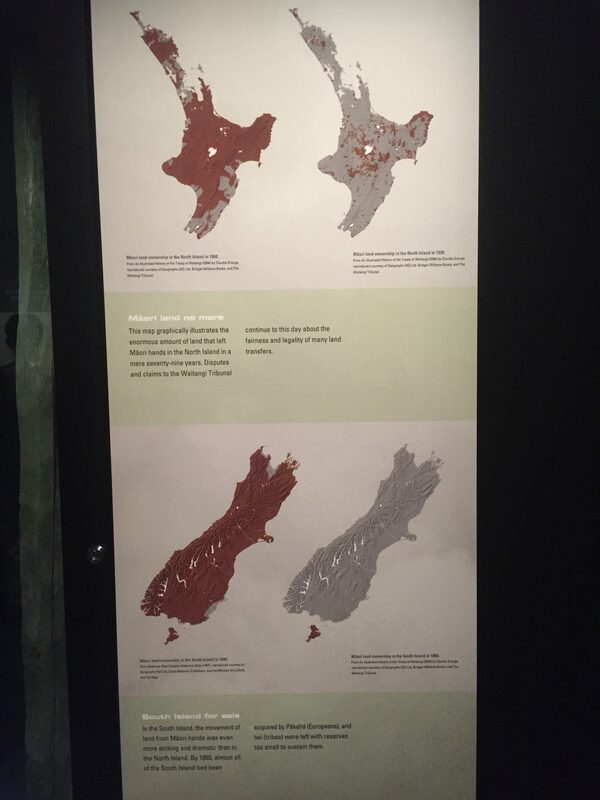 History of New Zealand, briefly: There are exhibits which detail the formation of earth by the geologic record. There are exhibits which detail the formation of earth by Maori mythology. Both are important. I was struck by the fact that according to the Maori, Tane, the life force, molded Hine-ahu-one, the first woman, from kokowai, red earth. In Judeo-Christian belief, Adam was formed earth and my name means man of the red earth. Adom is the Hebrew word for “red”. In the film Moana, there is mention of Maui, the trickster hero, stealing fire from the underworld. Maui tricked his grandmother Mahuika, made of flames, into parting with her fingernails and toenails. When she realized she was being decieve, in her anger she threw a burning toenail at Maui who turned into a bird to escape the rising flames, which flared into the volcanoes. Legend tells how Maui fished up the North Island, from his canoe, the South Island. The shapes of the islands make a convincing argument. The Maori are thought to have first arrived in New Zealand in the waka hourua, double-hulled canoes, around 1200 CE. James Cook was the first European credited for the discovery of New Zealand around 1769. A naturalist on his ship, Joseph Banks, had an ambitious vision to turn New Zealand into a pastoral country and envisioned a “Britain of the Southern Hemisphere”. Thus began the introduction of sheep, cattle, goats, wheat, maize, and oats. The treaty of Waitangi in 1840 established that New Zealand was part of the British Empire. However, 5 years prior, Maori had signed the Maori Declaration of Independence. New Zealand regained its sovereignty at the signing of the Treaty of Versailles in 1920. The 1865 Native Lands Act required the title of Maori land to be in the name of no more than ten indiviuduals rather than being held collectively by a tribe. After this law, extensive tracts of land were sold to European settlers. The 1860’s to 1940s was a period of “acclimatising”. The aim was to introduce harmless exotic species, primarily for hunting purposes, to enhance the “inferior” landscape. However, they severely miscalculated. Ferrets, stoats, and weasels were introduced and now are an invasive species. The only native mammal in New Zealand is a species of bat. Also the beautiful kauri forests were milled until over 90% of the trees were destroyed. I was struck by a diary entry which described the “exceeding joy of burning” native bush and planting grass to feed the lambs and cows. Since the 1940s, New Zealand has successfully developed and enforced strict biosecurity at customs to protect New Zealands natural species of plants and animals. One who started this movement a hundred years ago was Herbert Guthrie-Smith. He wrote a book in 1921 in which he described the disappearing indigenous plants and animals as “a sad, bad, mad, incomprehensible business.” He recognized the importance of biodiversity and the threat of erosion, and was quite a leader in the field of environmental conservation. Today, one-third of New Zealand is protected in parks and reserves. In 1901, New Zealand was the first country in the world to set up a government department dedicated to tourism. Incredibly disappointed in the President, who does such treachery while proclaiming to uphold American values. Make America great again by taking in those in need, not closing the door. After perusing art galleries on the top floor of the museum, I finally made my way out to the windy harbor. I was picked up by Tony’s wife, Vesna. She is an angel, because she took time out of her day to drive me to LotR filming locations for the next 3 hours. She’s not even a fan, and I cannot express enough how thankful I am for such exceptional treatment. We followed the Hutt River to the Upper Hutt Valley. We found a place in the river where close-up shots of the fellowship in canoes in the Anduin River after leaving Lothlorien were filmed. Then a short distance farther is Harcourt Park where Gandalf and Saruman were filmed walking through the Gardens of Isengard. Then we drove to Kaitoke Park, where Rivendell was filmed and there are markers to help visualize where specific scenes were shot. It is a beautiful park and I would love to return and spend more time there. We headed back to Wellington and Tony took me to Victoria Park. We found the location where Frodo yells “Get off the road!” and the hobbits hide under a large tree root from a black rider on a horse. The filming site is quite remarkable because the park is in the middle of the city! 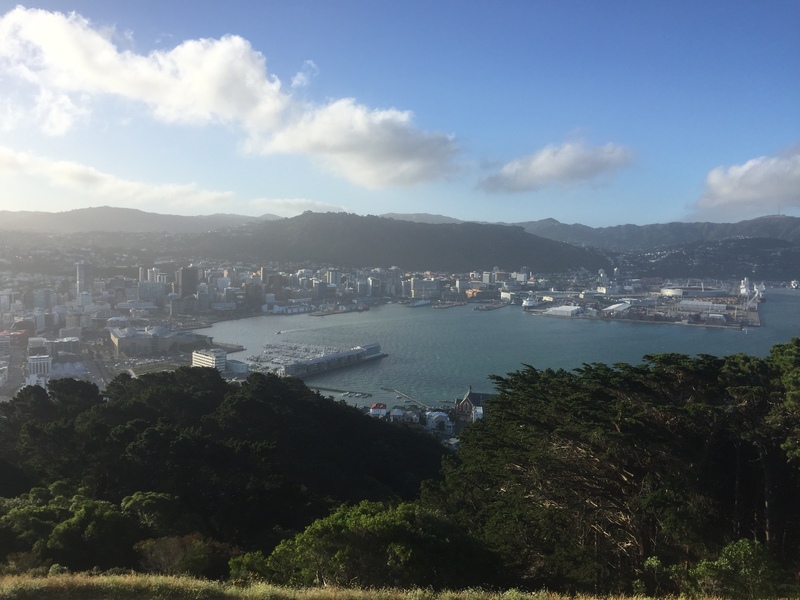 At the top of the peak of the mountain is a glorious panoramic view of Wellington. It was another night where I slept well. And its a good thing I did because of the spontaneous crazy plan for the next day. Thank you to Tony and Vesna for planting the seed in my head, because I never would have come up with this plan on my own. Mostly because I am terrified of small airplanes. Heights don’t bother me much, but small spaces do. And I’m very susceptible to turbulence. But I said to hell with it. Instead of hanging around Wellington for another day, I took a day trip to the South Island arriving by air and returning by boat. Booking a flight 2 hours before boarding is quite a liberating experience. So is traveling with a day pack rather than all my luggage I’d been schlepping around. I did start to regret my decision when I saw the Sounds Air Cessna C208 Caravan on the tarmac. But when we went airborn I was absolutely thrilled. The view of the Cook Straight was incredible. 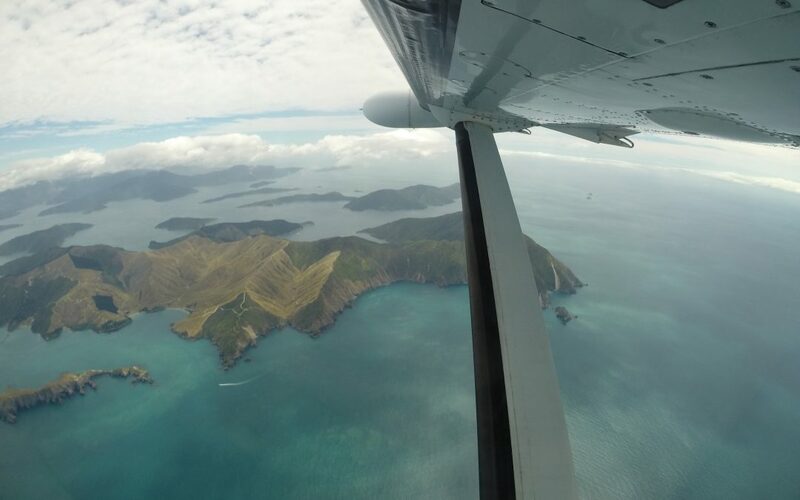 The Marlborough Sounds are a labyrinth of green islands placed divinely in the bright blue water. Far below there was a single boat arcing around an island, isolated from all other humanity. The stronger the fear, the more incredible the experience of overcoming it. This was one of those moments. I was smiling ear to ear during the 30 minute flight. The sun is on your back now. No need to shield your eye. You are caught between two shades of blue. You are searching for something you cannot describe. You’re dreams present themselves to you disquised as reality. The sun is setting, and you are on your own. Lonliness would be a strange thing if it wasn’t so familiar. Loneliness was a common theme of the trip, but it comes with the territory of traveling alone. The lights of Wellington appearing on the horizon provided an incredible sight. The winds got too strong in the harbor and I had to finally clear the deck. I woke up back in Wellington in the North Island the next morning and packed for my flight later that day. But there was hiking to do before I got on another plane. I met up with Jonathan, a friend of Ruth and Raoul’s (my hosts in Auckland). Jonathan is a cheerful, down to earth, and kind guy who moved to Wellington from the states. He’s a musician as well. He took me hiking in Zealandia, the world’s first urban ecosanctuary. The 550 acre sanctuary is surrounded by the most sophisticated fence I’ve ever seen, designed to keep out all non-native fauna, which includes mice, weasels, and possums. Indeed the place is Jurassic Park both in visual similarity and mission, which is to restore the valley and freshwater ecosystem to its pre-human state as it was 1000 years ago. They expect it to take 500 years to fully realize this dream. 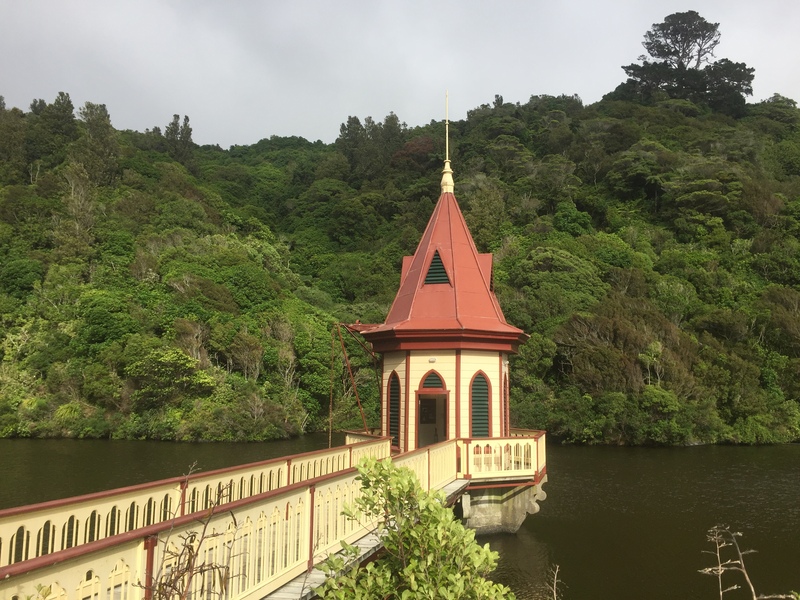 However, it is already becoming a reality as evident by the successful reintroduction of 18 species of native wildlife and flourishing of rare native bird species, that can often be seen throughout the city of Wellington. Jonathan could identify each bird encountered, often before we even saw it because he knew their calls. We also saw tuatara, a rare native reptile. Then I flew back to the South Island, this time on a larger plane to my next destination: Queenstown. 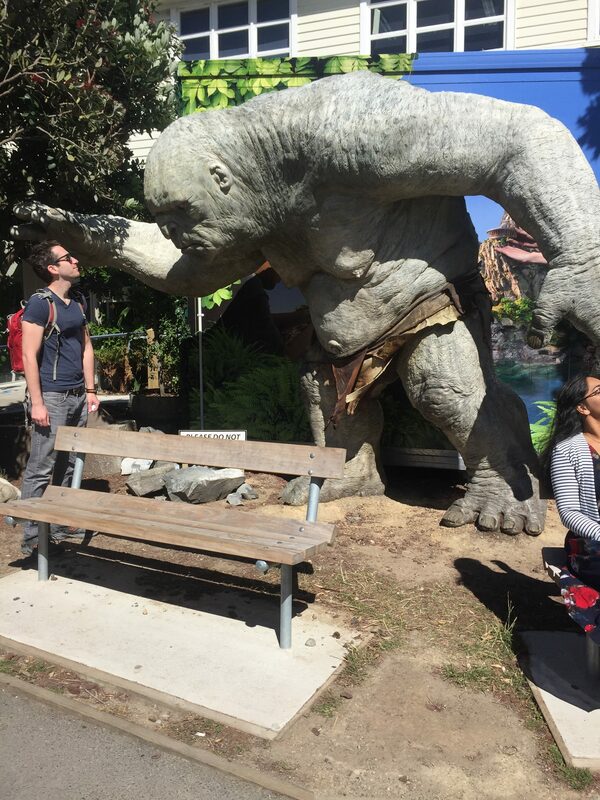 Face to face with a cave troll at Weta Cave. 10-ft sculpture of a medic at the Galipoli exhibit. View of Wellington from the peak of Mount Victoria. 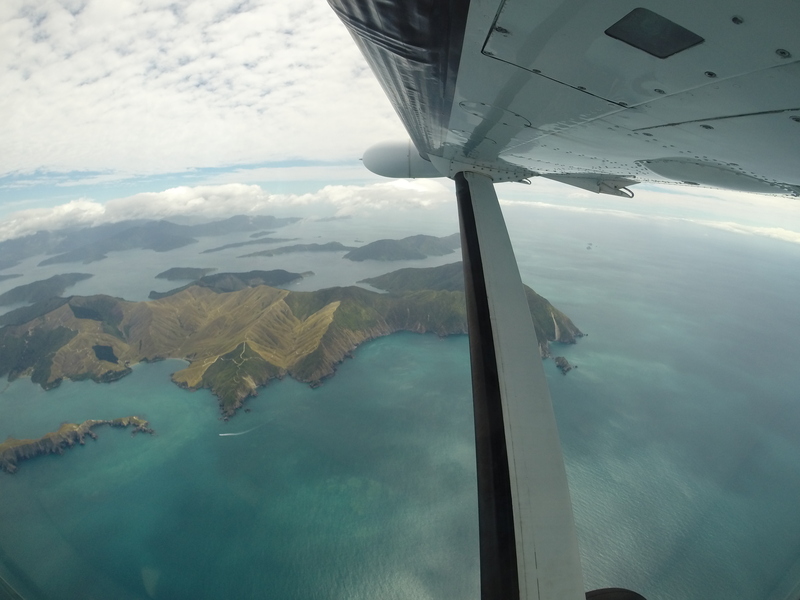 Conquering fears on my flight over the Marlborough Sounds to Picton. 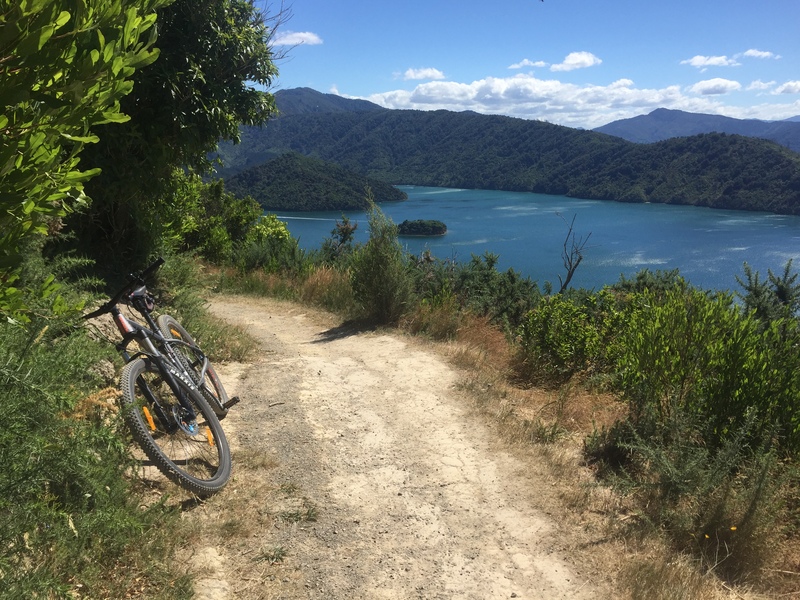 Mountain biking near Picton on the South Island. 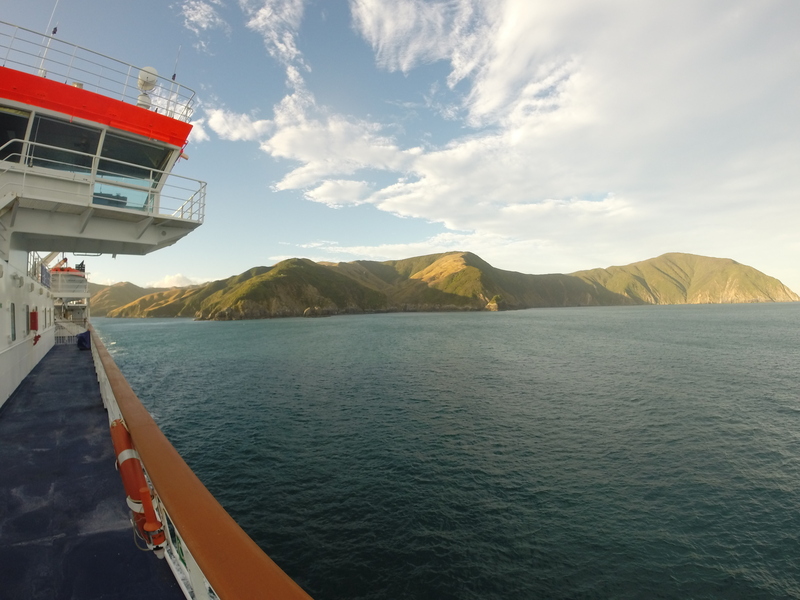 Interislander Ferry back to Wellington.